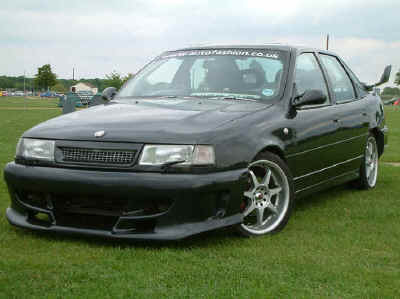 This car belongs to one of the company Managers, and started off as a very standard Cavalier Mk3. The 2.0 litre 16 valve engine gives the car a bit of go, and the new Animal kit (developed on this car) combined with the marble paint gives the car a bit of show. 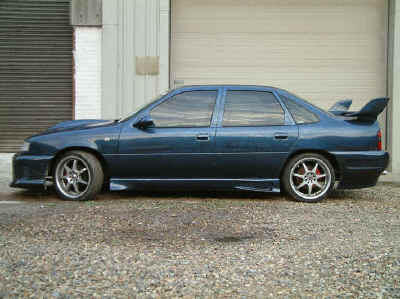 The kit suits the Cavalier very well indeed, and the paint is something of a split personality. From a distance the car just looks black. When you get closer it seems to actually be a very very dark metallic blue. A few steps closer and the fantastic marble pattern appears as if from no-where. 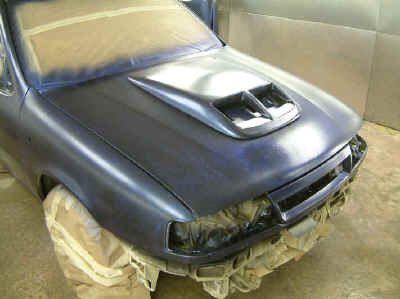 This finish took over 18 man hours of paintwork to achieve. That's paintwork time in the booth. The fitting and preparation took about another 100 hours. We didn't take any before photos which is pretty unusual for us. Here you can see the very first Animal kit for the Mk3 Cavalier in our small booth (we have a total of three). 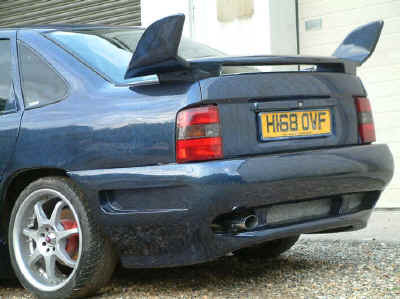 Also you can see a second hand replacement boot lid in the background. 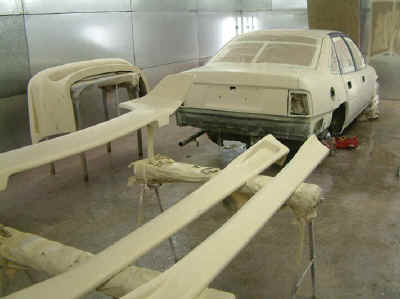 As you can see below the kit is primed and then painted black. Because the mouldings are very good and the paintwork is temporary, the kit is primed and then using a process known as wet-on-wet painted within a few minutes. This is not something we normally do, because it does compromise the quality of the job, but it did save time in this instance. 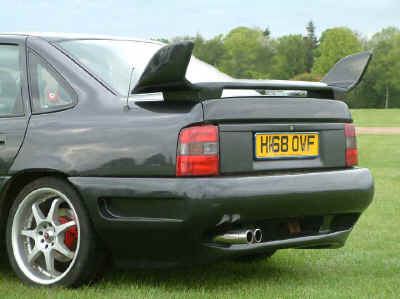 Phase one of the project involves fitting the front and rear bumper and blade-less spoiler, along with the replacement boot lid. 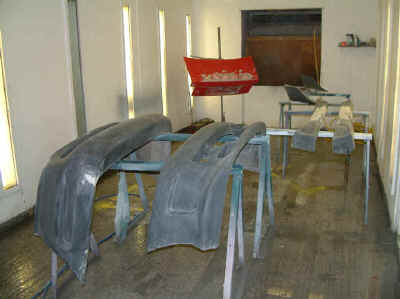 Phase Two of the project involves a complete strip and paint in blue pearl marble. 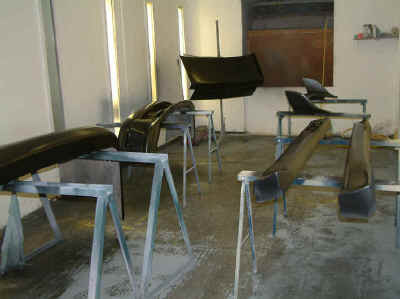 At this time some minor rust will also be dealt with along with a pair of rear arches. In the pictures they don't look all that bad but some bodges by previous owners have left them with several arches fitted over the top of one another and as usual they are rusting through already. The only satisfactory solution is to completely remove the old metal work and fit just one arch, welding the inner and outer arch together as required for MOT and for safety. The two have not been joined for some time now. 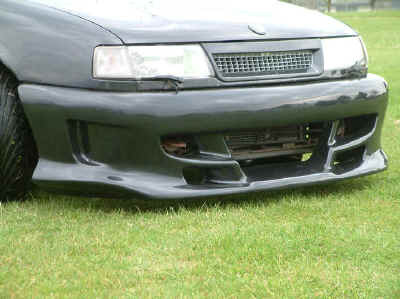 The car actually drives better once this arch work is complete. We always seam weld these panels at the top because the car was solid metal here originally. 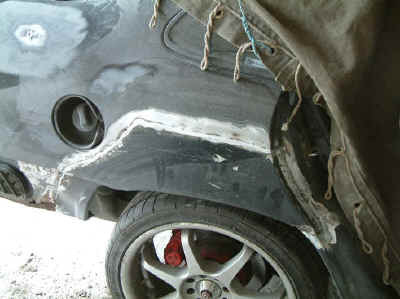 Spot welds always show later - its just a matter of time (normally 6 months). Seam welding does create a little more distortion, which you can see was remedied with filler. It looks a lot on the car but as you can see it covers solid metal which means it should last 6-10 years easily, and is actually very thin. 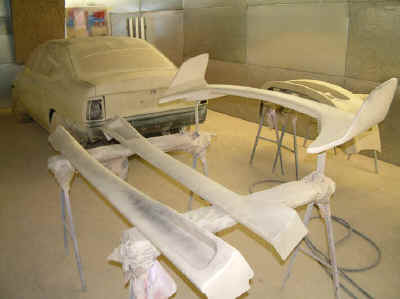 The whole car and all bumpers/spoilers are very thoroughly sanded (in this case 120 grit), cleaned using special panel wipes and then treated to 5 litres of best 2 pack primer). The guide coat of thin black paint you can just see above is to help in the next stage which is to flat the primer once it has fully cured. For this we use a 400 grit. 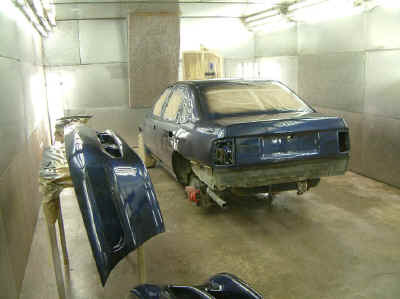 The photo on the left does not appear all that different but shows the car ready for paint. 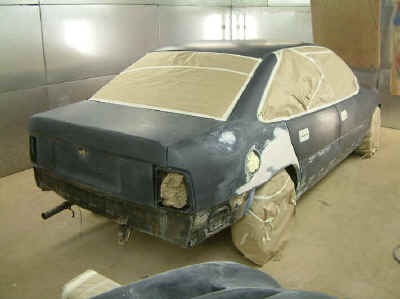 The primer has been laboriously sanded and flatted to provide a flat surface for the paintwork. The car has been remasked, cleaned, and the floor soaked to reduce dust. It is interesting to note that the work to date has taken over a week. Its time to take a breath because the next stage is very hard work. It requires three people working as a team and a total of 18 manhours of painting time. 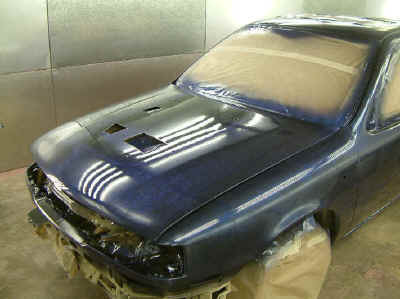 Firstly the car must be painted in what we call the ground coat. 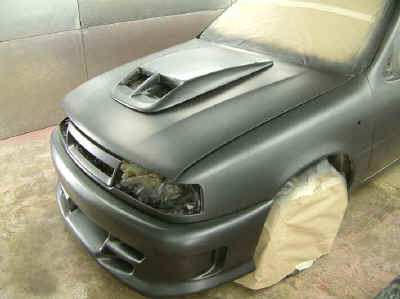 For this car we use a metallic black/grey colour basecoat. For good coverage all the parts are painted off-car. 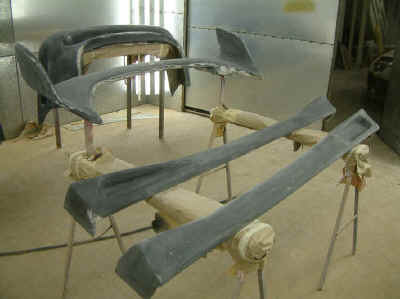 The colour of a ground coat varies depending upon the effect required. 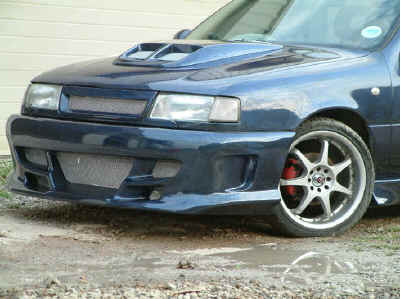 The next stage involves very carefully refitting all the parts to the car. 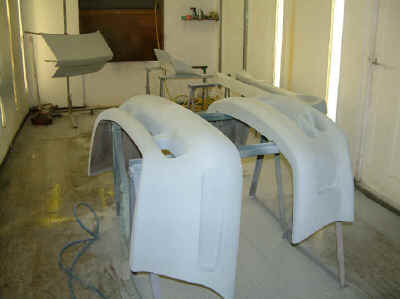 Basecoat is designed to be coated in clear lacquer for protection and in this raw state is very easily damaged. Time is also a serious issue because basecoat should never be left for more then 45 minutes or the following coats will not stick properly, which can result in peeling! Once refitted the marbiliser is applied. If you look carefully you can make this out (above). This is a contact and reaction effect. Meaning that three people must apply the effect. Time is still a serious issue. Once the marble is done it must be allowed to dry before the parts are again very carefully removed, noting the time and damaged issues explained above. We apply the marble with all parts on so that the pattern follows over from one component to another. Painting with the parts on leads to bridging (paint joins one component to another), and also to thin spots (where two panels sit too close for the air containing the paint to flow into). 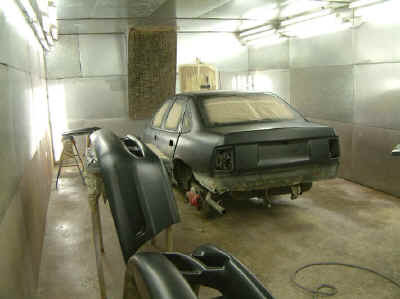 For this reason both the black ground coat and the clear coats are applied with the parts off the car. The next complication is that the marble effect is by its very nature inconsistent in its coverage. 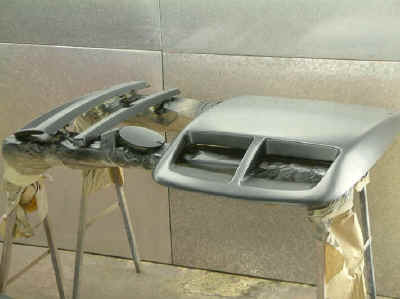 It has parts that are thin (you can see the ground coat) parts that have medium coverage and very thick parts (you cannot see the ground caot at all). 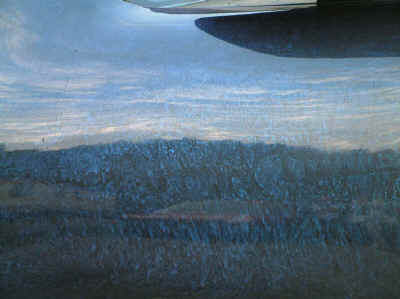 Thus the next layers of clear paint have to cover an undulating surface. For this we build the paint up slowly (not too slowly or the next coats won't stick) and use in total about a gallon of clear. Luckily we have done this many time now, and the greatest assets we have are experience and good equipment.